Practical and skills-based modules at all stages and a residential field course in Year 3. The course is strongly vocational with an emphasis on participation in field activities using the latest exploration and hydrographic systems. Field activities start in Year 1 with a series of practicals providing hands-on experience of both land and marine survey instrumentation. This continues through the second and final years, when practical work is extended into field weeks, progressively allowing you to develop within project teams undertaking survey tasks. 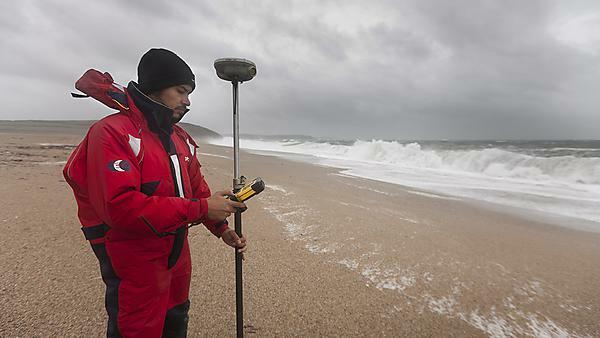 These field weeks include coastline mapping and bathymetric and environmental surveying. While work is usually conducted locally within Plymouth Sound, the skills developed are compatible with those needed for similar operations in the deep ocean. You'll be involved in beach profiling, measurement of tidal currents and patterns of temperature and salinity variation in Plymouth Sound, seabed characterisation using side-scan sonar, data collection focused on exploring positioning and remote sensing, and reviewing the value of the estate along a section of coast.